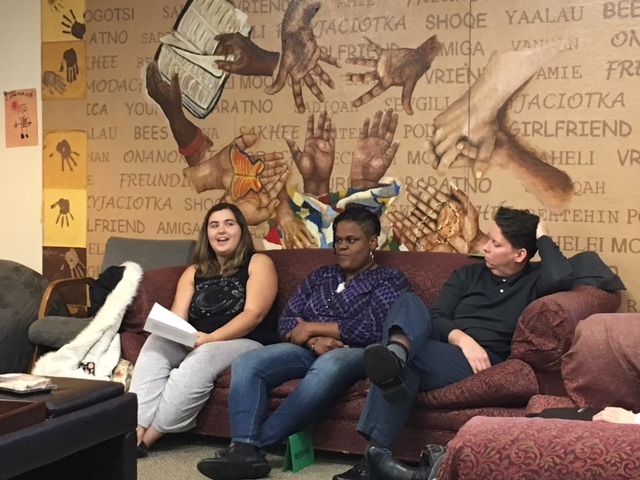 Last week on Wednesday, November 8th, the Women’s Center held our final roundtable discussion of our fall series. The theme: Women in Writing. Panelists, moderator, and participants generated a fascinating discussion on the valuation of women as writers, artists, and creators in greater society. Although much of the criticism that was voiced made for a bleak outlook, our panelists passed on enlightening advice for all artists struggling to make a life with their work. The roundtable began with the moderator (in this case, myself!) presenting some statistics to ground the conversation. Student staff members had done research to discover the representation of women as both content makers and content matter. Some highlights in these statistics include that women have made gains in more bylines from 2011 to 2014, but they still don’t make up even half of the men’s bylines; half of the National Book Award recipients from 2000 to 2014 have been by men and about men; and similarly, more than half of the Pulitzer Prize recipients from 2000 to 2015 have been by men and about men. In adding an intersectional lens to this data, we also find that women’s publications (when they actually happen) are dominated by white women–women of color, as you may have guessed, make up only a small fraction of the women published in both Poetry and The New Yorker. Check out VIDA for even more numbers on this topic. There is a double standard in today’s literary canon. Women are constantly reading about men and books by men, but men reading books about women/by women is not emphasized in the same way. Johanna brought up, for example, that despite the Hunger Games series popularity, many men in her life refused to read the books because the main character was female (and written by a woman). The wealthy heterosexual white male gatekeeper has the power to set mainstream agendas. Many of the panelists agreed that the mainstream art society was a typically masculine space defined by male gatekeepers. When we have those gatekeepers in the form of editors, publishers, producers, etc. they control the agenda, which more often than not does not place value with marginalized creators and their content. Despite the harsh landscape, progress is being made. Both Tanya and Missy spoke to the idea that there is plenty in the world that motivates them to continue what they do, and that comes in the form of the other folks like them–people of color, LGBTQ folks, etc.–who are being published, performing, and making careers for themselves. This visibility, to both Tanya and Missy, is crucial not only for them, but for all of the other writers and artists who aspire to grow in their fields. Missy specifically noted that she writes music and performs to empower others to do the same. You must value you yourself. In order to do this work, you must value yourself. You must continue to believe in your work and the process of honing your craft. This is the driving factor for all of our panelists. Sparked by a question in the crowd about the devaluation of spoken word poetry versus musicians as art, Missy brought up that you have to stick up for yourself. If, for example, you are the only poet in a lineup of musicians, you need to ask to get the same payout as the musicians, because your art is worth that much. The reality is that you are not alone. Although it can feel lonely and exhausting to be one of the only “different” people (women of color, LGBTQ people, immigrants, etc.) in your field, you are not alone. Tanya made this point and noted, as well, that even though it may feel isolating, there is a path for everyone–you just have to find it. For her, this meant finding the person who was one step ahead of her, and looking to them as a model and/or a mentor. Johanna noted that her ambivalence transitioned to enthusiasm in a writing class when she found that she was not the only person writing stories about queer people. Just so, when we find the people who make space for us, we need to take it and make more space for all those who follow. 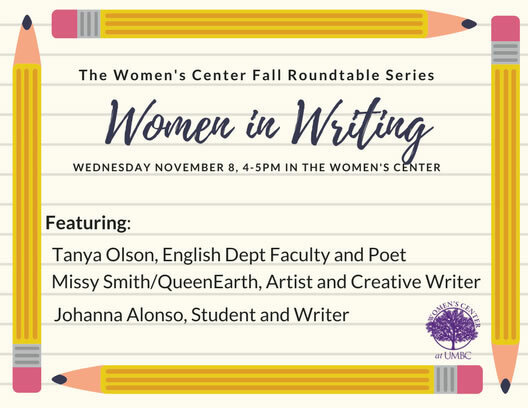 This rich conversation made clear that although there are many barriers that make women writers and artists journeys more difficult, these also create the richness and depth in their stories. The struggle, in some ways, necessitates the story/song/play/etc. in our world, and that success in writing is the sustained progress we make as we take up space and demand equity in the valuation of our art. Do Women Get to Write with Authority? I really love queer media. I’ve probably watched most of the movies in the “Gay and Lesbian” category on Netflix, as long as they didn’t look too dull or exploitative. There are some really fantastic and challenging shows and movies available at the click of a button. Why am I so drawn to television shows with women kissing, to movies with actual trans actresses playing trans women? I know I’m not the only queer woman who revels in the opportunity to see a new lesbian drama. Why is this? Well, it all boils down to one thing: The need for representation. The queer community is constantly portrayed by the media through stereotypes and tropes that are incredibly harmful and inconsistent with the realities of our queer lives. This article from the queer- woman’s website Autostraddle recently went viral – because it listed all 162 (and counting) dead lesbian and bisexual women killed on television and how they died. The following is a little of my experience as a queer Muslim person. I recognize that my experience is not reflective of Islam, nor of the community of people I met at the Interfaith Center. For the first time since last Eid al-Fitr, a Muslim holy holiday, I went to Jumu’ah (congregational Friday prayer). I met a person on campus who extended a warm hand and invited me to prayer which took place at the Interfaith Center. I was both excited and terrified for a plethora of reasons. I was excited to sit amongst my sisters, to rejoin the community I had left behind me as I entered college, and to listen to the guest Sheik that was invited to give the khutbah, the congregational sermon. A blog reflection written by Women’s Center student staff member Meagé Clements. This post is an expansion of her statement in the UMBC Women’s Center and Women of Color Coalition’s “I’m Not” anti-stereotype campaign for the Telling Our Stories project, which we posted about here. It’s been over a year since I first read recent UMBC alumna and former Women’s Center student staff member Bria Hamlet’s blog post Blackish: Telling My Story and her words continue to resonate with me. She described how she often felt that her blackness was invalidated by others because she didn’t fit the “stereotypical Black mold.” Her blog post made me recall my own experiences with microaggressions and respectability politics, even before I had words to describe what I was facing. Upon thinking about my “favorite” microaggressions to include on my anti-stereotype poster for the Telling Our Stories Project, a million ideas popped in my head; several about my name, a few about my natural hair, but most were about me being — or not being — “Black enough,” and how other people often take it upon themselves to decide when I am capable of being associated with my blackness. Growing up, I attended predominantly white schools, but I had always surrounded myself with a small yet diverse group of friends. I remember several times when my Black and non-Black friends alike would joke about how my “Black card should be revoked” or how I was “barely Black” for any number of reasons. Most often, it came down to the fact that by being an introvert, I couldn’t possibly be Black. Because I wasn’t the stereotypical “loud Black woman,” I wasn’t Black enough. Because I grew up in a two-parent household, I couldn’t be Black. Because I “spoke like a white girl,” I wasn’t deemed Black enough. Three years ago Women’s History Month’s national theme was “Women Inspiring Innovation Through Imagination: Celebrating Women in Science, Technology, Engineering and Mathematics.” The theme honored generations of women who throughout American history have used their intelligence, imagination, sense of wonder, and tenacity to make extraordinary contributions to the STEM fields. At UMBC we honored this theme by partnering with the Center for Women in Technology (CWIT) to feature some of their amazing students participating in technology in the engineering and information technology fields. While the theme for Women’s History Month changes every year, we have come to love the tradition in spotlighting the stories of UMBC’s CWIT women. So with that, we are honored to bring you the 3rd Annual CWIT Showcase in honor of Women’s History Month. Meet Natacha Ngea! A CWIT Scholar and computer engineering major. Describe what sparked your interest STEM and the journey to choosing your major. Meet Rachel Cohen! A CWIT Scholar and computer science major. Meet Elyse Hill! A CWIT Scholar and mechanical engineering major. My interest in STEM was sparked in middle school by my mother. I had a heavy interest in architecture at the time and my mom suggested to me that I should look into pursuing the math and science behind the architecture. That led me to look into engineering, which I found to be a very broad field. In the summer of my 10th grade year, I went to an Exploring Engineering camp at the University of Maryland, College Park where I was exposed to the many disciplines in engineering that UMD had to offer. After coming to UMBC, I decided on mechanical engineering because I found that it was the most versatile of the engineering programs we offer here. Tell us about an internship, research experience or project that you are proud of. Last summer, I studied abroad in Lille, France at the Catholic University of Lille. There, many other students and myself engaged in culture classes, french classes, and discipline-specific classes (I took a solar energy course) while getting to experience French and European culture. I was very proud of this experience because I got to successfully apply the language I studied in high school while immersing myself in a foreign culture. The day I was the proudest was the day I wandered around the city of Brussels all by myself with only my map and a language I barely spoke as my tools. Who are your role models in the engineering or IT field? How have their stories influenced your educational or career goals. I have many role models in my major, the most impactful of which have beenUMBC’s Dr. Maria Sanchez and Dr. Anne Spence. Recently, I’ve developed an interest in the field of engineering education, something both Dr. Spence and Dr. Sanchez do research in and hold a passion for. When I discussed this field with each of them, they expressed to me their own opinion on the subject and how it is a rising field of great importance. Since hearing their explanations, I have been more motivated to consider the field as a research topic for graduate school. Thanks to an email from Dr. Spence, I found out about an REU focused on engineering education that I applied for and got accepted to for this summer. In addition to their advice, just them being women in engineering is influential to me, and motivates me to become a college professor who inspires students, just as they have inspired me.